Uminote is a 5-piece Japanese rock band with the members of Souon Sasaguchi (vocal/guitar), Psuke Takano (guitar), Masayuki Hayase (bass), Maho Kikui (drums) and Miki Teramoto (glockenspiel/keyboard). They came together in 2010 to play Sasaguchi’s songs originally played with the harmonica as a band. 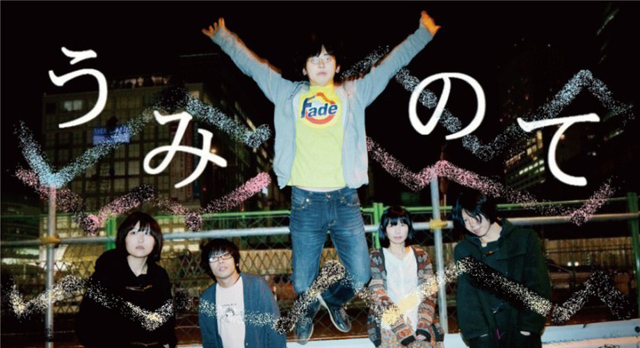 In 12/2012, they released “Mohaya Heiwa dewa nai EP,” a limited single exclusively available at Tower Records. In 3/2013, they released their 1st full album “IN RAINBOW TOKYO” with collaboration of a renowned engineer AxSxE (NATSUMEN).